My o my, it is right up in the coldest time of year here! 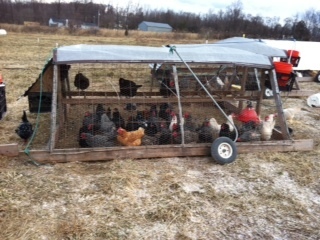 Everyone and everything is just working to keep warm. Of course, it was almost 60 just 4 days ago! The ground has refrozen. It was a sea of mud. It snowed a bit and was not above freezing all day. No real sunshine. It is scheduled to be extra cold with no real sun for at least 5 more days. 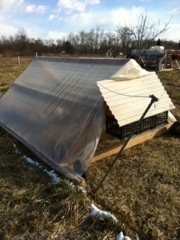 Here is where the laying hens spend the winter. 8 pens like this line up and move to a new spot every day. Note the snow blowing around, in the furrows of the ground, in the tufts of grass. 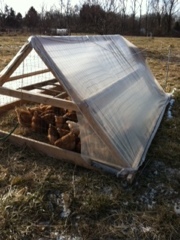 The roosts are above their heads so when the pens roll the girls can walk along easily. At night each flock loves to jump up and hunker down close together, and since we are getting plenty of eggs daily, it appears that the ladies love this arrangement! The farmers love that mucking the stalls takes 10-15 seconds. It is cold enough that water is not liquid. So it has to be hauled quickly in buckets, and the livestock drink up fast, before it is in a solid form. Ah winter.